what about The neuraminidase of bat influenza viruses, I read that ir is not a real neuraminidase?? it´s truth that?? 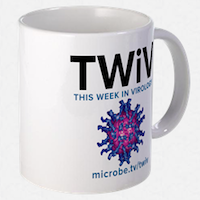 I listened to the last two TWIVs on Thursday while I was driving to and from Tours (I was on my way to have the purification of BK virus VLPs demonstrated to me by Antoine Touzé). Since it is about a two and a half hour drive each way, I had plenty of time, but I thought that 3 episodes in one day was going to give me a bit of an overload. Anyway, my comment doesn’t concern virology, rather Rich Condit’s pick concerning colour vision and language. The TV documentary that Rich linked seems to be the latest twist in a long story that is beautifully told in the linguist Guy Deutscher’s book, “Through the language glass”. In fact, the question of language and its effect on colour vision goes back to the 19th century (rather curiously because the British prime minister W.E. Gladstone pointed out that Homer’s use of colour in the Odyssey and the Iliad was rather odd – in particular, Homer never described anything as being blue, and famously talked of a “wine-dark sea”). Subsequently, during the late 19th – early 20th century several expeditions set out to test colour vision and language in a variety of different isoolated ethnic groups. It turns out that many groups of hunter-gatherers / pastoralists have languages with simpler colour schemes, and indeed, languages with words only for “black”, “white”, and “red” are not uncommon. However, people who speak those languages can still pick out different colours along the whole visual spectrum, even if they do not have words to differentiate between “blue” and “green” for example. Incidentally, 100 or more years ago this was done with a set of woollen threads dyed different colours, rather than with a computer or TV screen. This indicates that there is no fundamental difference in colour vision between humans – in the sense that we all have the same hardware for detecting different colours. However, as pointed out in the documentary, language does appear to affect processing of colour information, in that distinctions between different hues are recognized more quickly when different words are used to describe those hues. In the documentary, this is shown with the Himba, who have two words for different types of green, and this had previously been demonstrated by comparing the recognition of different types of blue in Russian and English speakers. Russian, unlike English, has two words for blue (Sinii for dark, navy blue; Goluboy for clear, azure blue), and sure enough, Russian speakers can distinguish shades of blue quicker than English speakers.